Is there a way to globally adjust the brightness/contrast or add bloom in the video sequence editor? Using Blender 2.79, and creating a video sequence from image strips. There are 20 or so strips so using compositor nodes or equivalent would be faster than adding effect strips to each clip. Trying to use the compositor nodes like in still frames, but the compositor node doesn't seem to be changing the output. With the brightness and contrast settings enabled, the background in the video will be black. As atomicbezierslinger suggested, rendered the video to frames and used those as the input on the compositor. Works, very easy! The 3D View Composited Rendered image can be input to VSE. 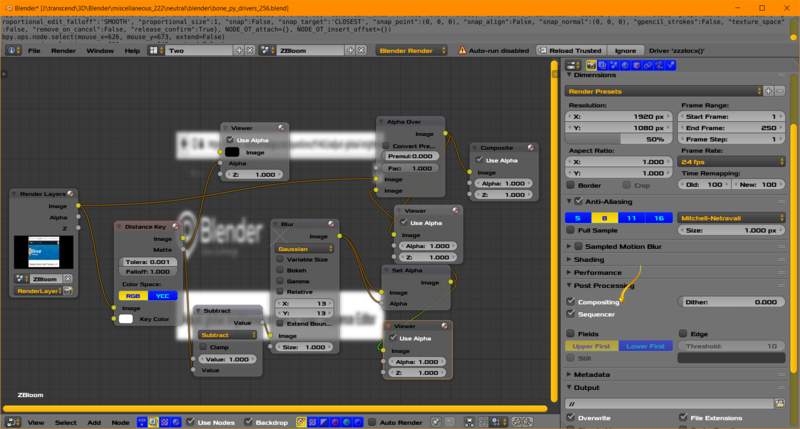 Above image shows the Render Layers allows the user to select another scene. The Input node in yellow is for a sequence of images. 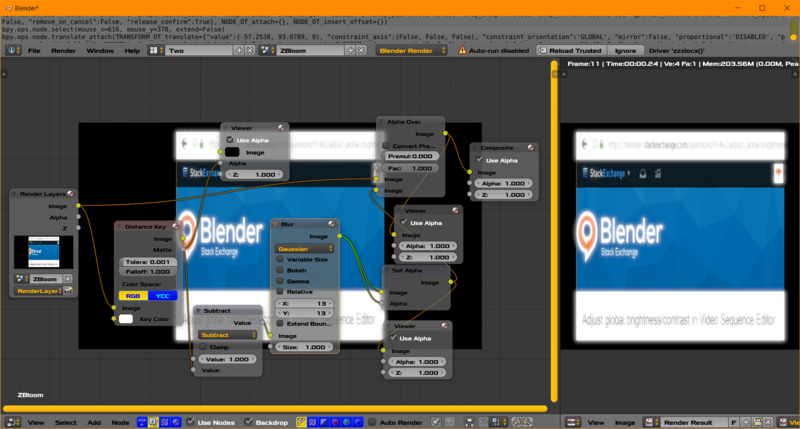 It is not yet connected but it can replace the Render Layers Node as input. 88 seconds of work or less. The VSE rendered image can be input to Compositor. Any Rendered image can be Composited in a different Scene. Similar to GIMP or Photo???? 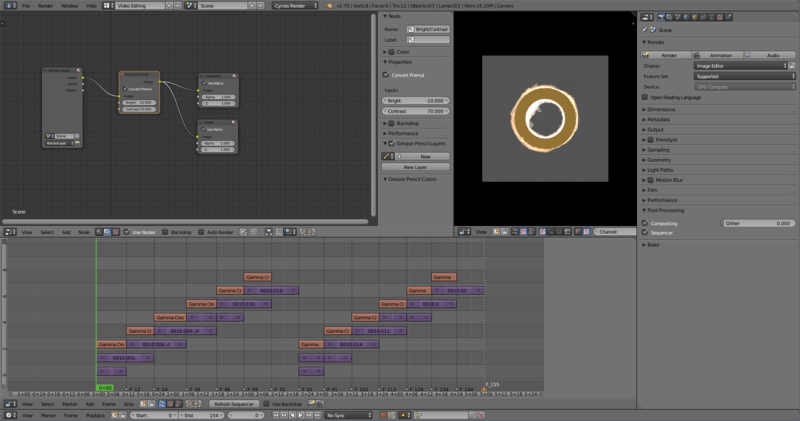 Some Blender Users may need to create an image sequence in intermediate stages. Next those images are used again in another scene. This may or may not be acceptable. The question of one scene using another scene may arise, or these steps can be manual. 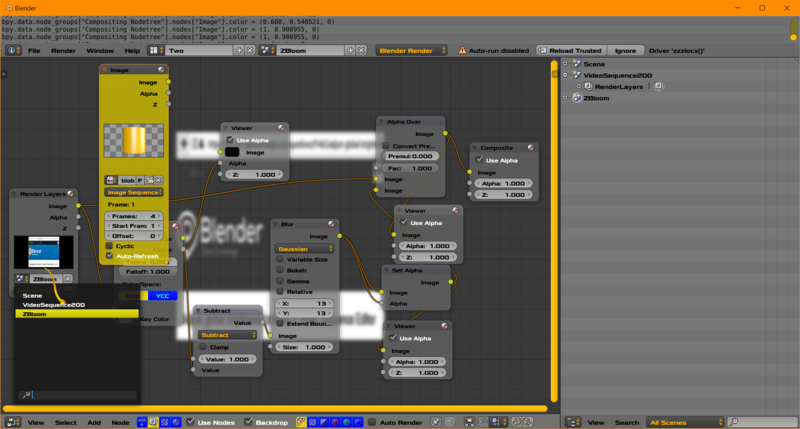 Note the Render Layers Node has an entry for a Scene. Thus one scene can reference another scene. This answer will not focus on that useful feature of Blender. That may be a new question about that feature. Click image to see larger image. Not the answer you're looking for? Browse other questions tagged compositor video-sequence-editor or ask your own question. Is it possible to make a video texture repeat in the compositor? How do i work with UV Toolshelf directly from strips?